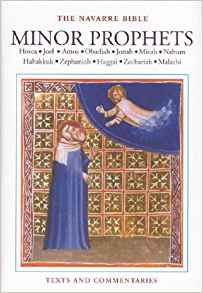 This volume of the Navarre Bible commentaries sheds light on the twelve minor prophets of the Old Testament: Hosea, Joel, Amos, Obadiah, Jonah, Micah, Nahum, Habakkuk, Zephaniah, Haggai, Zechariah, and Malachi. The Psalms aside, the books of the prophets are the Old Testament sources most often referred to in the New. Their message covers all aspects of Israelite and Christian faith - belief in One God, his chosen people, the Messiah and the path to salvation. Like all the books in the Navarre series, this edition will help to deepen your understanding of these sacred texts. This book completes the Navarre Bible Old Testament series.